To learn more about Orlando bankruptcy procedure, view the links above. By taking the time to educate yourself about bankruptcy in Orlando, you are preparing yourself to make the best decision for your financial situation. Smart choices today can help you realize the future you deserve. To assist our clients, we have put together a resource page with the most relevant articles and research. Here you can find definitions and explanations of the terms and procedures involved with Orlando bankruptcy filing. 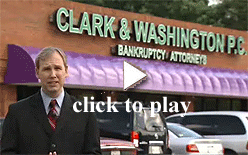 Educating yourself on terms and facts of bankruptcy will provide a clearer vision of the filing process. It will also help you get the most out of your consultation with our Orlando bankruptcy attorneys and staff. To help you find the information most relevant to you, we have organized the material into three main categories. In the Bankruptcy Terminology section, you will find commonly used terms that you will come up throughout your Orlando bankruptcy case. Bankruptcy Chronology explains the sequence of events you can expect to encounter when you file for bankruptcy in Orlando. Your Orlando bankruptcy lawyer at Clark & Washington will also share this information with you as your case moves forward. The Bankruptcy Misconceptions section includes explanations and corrections of common misconceptions about bankruptcy that we have heard over the years. You may be surprised to find that many common beliefs about bankruptcy that are accept by most as fact are actually exaggerated or untrue. We hope that these resources will help you to feel more prepared as you consider filing for bankruptcy in Orlando. For more information, contact us at 407-898-0299 to schedule a free consultation with an Orlando bankruptcy lawyer.